Not much going on this morning from the looks of the futures but the last 2 days could have produced an A wave up and B down of some degree. The B down could still be in play today but it's trying to hold and turn back up, so a C wave might be next on the agenda. Wave counting is always just a "best guess" when trying to use it for forecasting the future. The bigger picture wave counts are usually easier to get correct but short term ones are quite hard. So I look for technicals too as well as what's going on for that week (FOMC meetings, Monthly Options Expiration, Holidays, Big News Events, etc...) to help me try and figure it all out. This week is the last week of both the month of March and the best quarter on record for percentage gains in a very, very long time. Therefore it makes sense that the big boys will want to write this down in their books to show off and be proud of themselves... plus use it to advertise of course too. That could be one of the reasons we've not seen much selling going on as they all are holding long until this quarter ends, and then re-evaluate the market and it's potential to keep going north or if odds favor a large pullback (which of course they would want to avoid riding down and therefore would want to sell some up here in this zone before it happens). 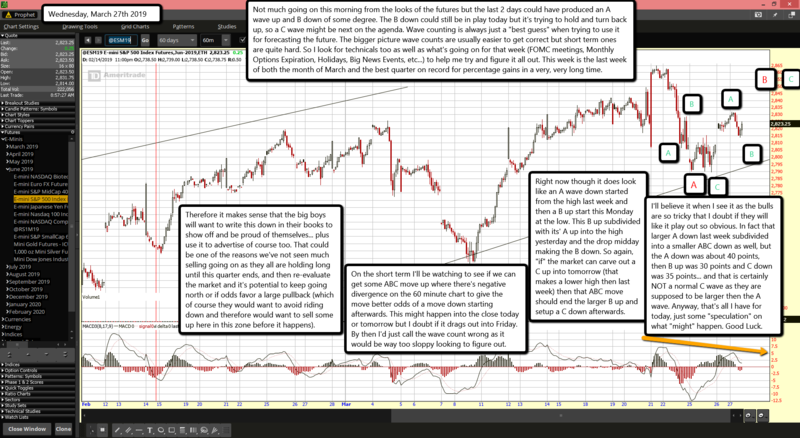 On the short term I'll be watching to see if we can get some ABC move up where there's negative divergence on the 60 minute chart to give the move better odds of a move down starting afterwards. This might happen into the close today or tomorrow but I doubt if it drags out into Friday. By then I'd just call the wave count wrong as it would be way too sloppy looking to figure out. Right now though it does look like an A wave down started from the high last week and then a B up start this Monday at the low. This B up subdivided with its' A up into the high yesterday and the drop midday making the B down. So again, "if" the market can carve out a C up into tomorrow (that makes a lower high then last week) then that ABC move should end the larger B up and setup a C down afterwards. I'll believe it when I see it as the bulls are so tricky that I doubt if they will like it play out so obvious. In fact that larger A down last week subdivided into a smaller ABC down as well, but the A down was about 40 points, then B up was 30 points and C down was 35 points... and that is certainly NOT a normal C wave as they are supposed to be larger then the A wave. Anyway, that's all I have for today, just some "speculation" on what "might" happen. Happy Hump Day.